Army investigators have begun looking into the circumstances surrounding last weekend’s death of a soldier from Joint Base Elmendorf Richardson during a field-training exercise on a range near Fort Greely. But, investigators aren’t saying much about the case. U.S. Army Alaska spokesman John Pennell says an investigation into the death of a 20-year-old infantryman during a training exercise near Fort Greely is well under way. 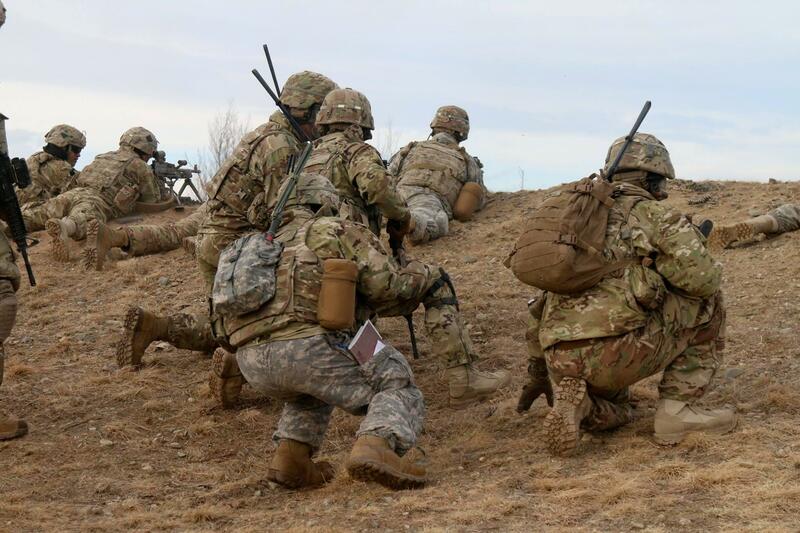 Soldiers with the 4th Infantry Brigade Combat Team (Airborne) practice warfighting on the Donnelly Training Area last month. Spc. Nicholas DiMona died early Saturday morning after being shot while his unit was maneuvering during a live-fire exercise at the Donnelly Training Area, Pennell said. “The soldiers were attacking toward an objective … so the soldiers were maneuvering as they were firing,” he said. Visibility was limited when DiMona sustained the fatal gunshot. “It was early in the morning on Saturday, so it was in the dark,” Pennell said. But he says the soldiers with the 4th Infantry Brigade Combat Team (Airborne) out of JBER were acquainted with the training area and the scenario. “The unit had been through numerous rehearsals, including daytime and nighttime drills with blank ammunition and also with live ammunition,” he said. But that’s about all Pennell would say Wednesday about the incident, citing the ongoing investigation. He declined to say where in the Donnelly Training Area the exercise was being conducted and what type of weapon killed DiMona. But he noted that several types of firearms were being used. And he says all personnel quickly responded after the soldier was hit. Pennell says Army personnel flew DiMona to Fairbanks in a helicopter that’s kept on stand-by during training exercises. But emergency personnel at the hospital declared DiMona dead. Pennell says the 4th Infantry Brigade Combat Team soldiers have since been working with investigators sort out what happened. He declined to estimate when they’ll wrap up their work. Pennell says combat is inherently dangerous, and so is realistically training for it. But he says the Army does all it can to make those exercises as safe as possible. Some 6,000 military personnel from Fort Wainwright and Joint Base Elmendorf Richardson will deploy next week to the Fort Greely area for a big, two-week field training exercise to test the Stryker Brigade’s combat readiness. And while they’re training on the ground, the Air Force will launch its latest round of Red Flag aerial combat training out of Eielson Air Force Base and Joint Base Richardson Elmendorf. Army veteran Stephan Wolfert will present “Cry Havoc,” the story of his struggle with post-traumatic stress disorder during performances and workshops that begin tonight at Fort Greely and continue into the weekend in Fairbanks. Wolfert’s a classically trained actor who says he found relief from PTSD on stage, especially when performing Shakespeare. Alaskans should expect more military aircraft operations over the next two weeks, as another round of Red Flag military training exercises begins. About 200 paratroopers from Joint Base Elemendorf-Richardson will drop into Deadhorse Tuesday as part of a joint Army-Air Force rapid-deployment exercise that’ll include Stryker Brigade soldiers and equipment from Fort Wainwright. One of the best moose-hunting areas in the Interior can be found on a military training range near Fort Greely. But a busy Army and Air Force training schedule is limiting hunters’ ability to get back into the area.